The glorious symbol of the might and prosperity of the USSR and the 1937 Grand Prix winner at the Paris International Exhibition – a 30-meter mosaic map of the Union made of jewels and gemstones – is being restored to its initial luster. The famous work was called “The Industry of Socialism.” The masterpiece, made from some 4,500 jewels and semi-precious stones as well as metal boards, will be carefully reconstructed with every single stone being cleaned and polished. More than 700 master craftsmen were involved in the creation of this gigantic Florentine-style mosaic for the Paris and New York exhibitions. Now, several workshops across Russia are faced with the task of restoring the beauty that touched hearts of the whole world and became a symbol of the USSR along with the famous “Worker and Kolkhoz Woman” monument by Vera Mukhina. 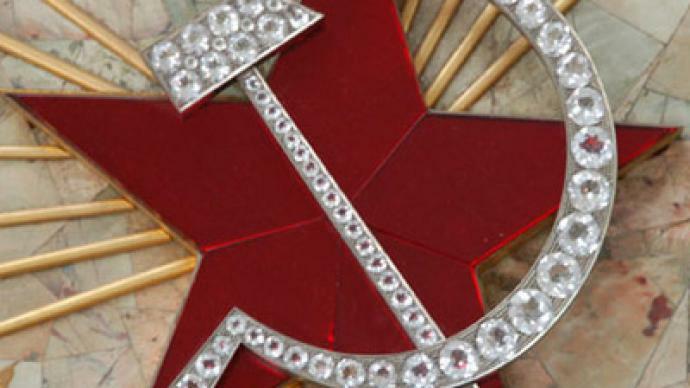 The National Emblem of the USSR made of gems. Image by Peter Sobolev from bcam.spb.ru. The mosaic showed signs of fracturing just after it was first exhibited in 1937 in Paris. The textolite base proved too fragile to support the three-ton composition of heavy stones. Ninety sections, each stored in its own safe box covered in textile for safety reasons, traveled the globe before ending up back in the craftsmen’s workshops – and not before time. With more and more jewels peeling off, the map was beginning to lose its contours. Luckily, all the stray jewels had been meticulously stored. “Nothing was lost, and this is an extraordinary thing for these days. The mosaic traveled a lot, was stored in many safes, but managed to survive all of it”, says Aleksandr Kharlamov from the All-Russia Research Geological Institute, as cited by the Rossiya 24 channel. Kharlamov will replace the textolite base of the mosaic with Italian shale to make the composition stronger. It is needed because after the restoration, every fragment of the puzzle will be seven kilograms heavier. “That was the weak point in the whole composition – its bottom, base. It used to deform and change its shape,” Kharlamov explains. Part of the map showing the Baltic States. Image from bcam.spb.ru. 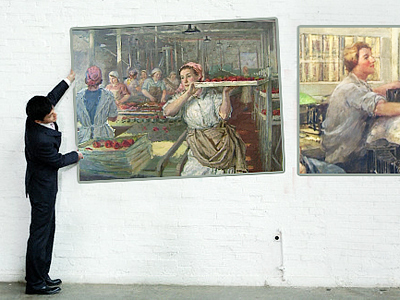 “The Industry of Socialism” was dispatched with extraordinary speed, with all the craft work being completed in an unbelievable five months. This may explain the weaknesses and the injudicious choice of material for the base. The map design was the brainchild of Grigory Orjonikidze, then People’s Commissar of Heavy Industry of the USSR. Detailed and painstaking work was involved in showing the relief of mountains and the winding of the rivers with the stone plates, and sticking to correct colors. After the map was made, craftsmen tried to keep it up to date, changing the frontiers after the war with Finland and the joining of the Baltic countries. Eventually, though, they gave up. During preparations for the New York exhibition in 1939, the height of the upper side was raised to show the North Pole and the route of Papanin’s expedition, using topazes and phenacites. The map was awarded the exhibition’s gold medal. After the restoration, the great mosaic will become not only a symbol of the former glory of the Soviet Union, but will also demonstrate the skills of Russia’s contemporary master craftsmen. Some of the stones are now unique as the deposits in which they were found no longer exist. The geological marvel that is “The Industry of Socialism” will become a window on the history of Soviet geological research. Read more about the non-existent country shown on the map.